New Energy Times (tm) is a project of New Energy Institute, an independent 501(c)(3) nonprofit corporation that provides information and educational services to help bring about the clean-energy revolution. [Ed: French researcher Henri Lehn has an interesting brief critique on the International Thermonuclear Experimental Reactor (ITER) project. Readers should be forewarned: Lehn's letter is not for the lay reader; it assumes that the reader knows about this subject. It was said at the time the tokamak fusion reactor prototype was conceived that it should be able to be developed within 30 years. Thirty years after JET and $20 billion later; the plans for ITER have been finalized: an experimental facility—soon to break ground—which will hopefully be able to demonstrate (Project name: DEMO) a working fusion reactor in another 30 or 40 years. The Tokamak reactor is a project that has been continuing on a constantly changing delivery schedule. But significant engineering problems stand in the way of creating a stable plasma and in achieving breakeven. The first wall torus is effectively a big problem: It must be completely leak-tight on the inside. However, it needs to be porous on the outside because of the production of helium in the material produced by activation by 14 MeV neutrons coming from the fusion reaction. A Japanese lab will be in charge of the development of this material. I can't imagine what kind of material this will be: one which is leak-tight and porous at the same time. But they certainly appear to have some ideas. I followed the development of the material for the Superphenix fastbreeder. Even under the influence of only 4 MeV neutrons, it is very difficult to maintain a stable steel envelope. Also, with 14 MeV neutrons, as are planned for ITER, nobody knows whether this problem has a viable solution. Another problem is that the consumption of tritium by ITER will be larger than the world's total production of tritium. Where will the fuel come from? The question of how to confine the tritium is a serious one, because confining such tiny atoms like hydrogen or tritium is impossible. The management of tritium is done through an air flow in a double envelope. The project managers are promoting the management of leaks; they are not so bold as to promise it will be leakproof. In the end, some tritium likely will be released to the atmosphere. Tritium is a beta emitter; it has a 12-year lifetime, not good for children and other living things. Even if ITER is successful, the next step, DEMO, has basic problems that are far from solved. To generate energy at 100 million degrees Kelvin is a good thing. But how do you plug your washing machine into such an energy source? It will come as a result of blankets around the torus - blankets made by a mixture of lead and Lithium-6. In fact, it’s the reaction neutron + 6Li that releases the energy. A steam generator operated by a water tube going through the blankets will be necessary. The possible physical (not chemical) reaction between liquid lead and water is extremely devastating. Such a reaction is more devastating than sodium on water. That's why the Russians have stopped development of fastbreeders using lead or lead-bismuth alloy. Who will agree to manage a facility having many thousands of tons of liquid lead even if the facility is not in use? How will they refurbish first wall blankets of hundred of tons of lead containing a huge quantity of diluted tritium and extract this tritium? Tritium has to be reinjected in the torus to maintain thermonuclear fusion. To reinject isn’t a problem itself. A pump is enough, but the problem is how to extract the tritium that is lodged in the lead. And who knows what will be the influence of the very powerful Greens? They killed our Superphenix fastbreeder project. Fundamental questions remain unanswered even if the ITER researchers are able to obtain breakeven and stabilize the plasma in ITER. Some years ago, I talked with Guenady Mesyats, vice president of the Russian Academy of Sciences, asking to him whether the Tokamak proposal for cooperation by professor Yuri Kurtchatov in the 1950s was a hoax. I think the U.S. government has made the right decision to get away from this Russian tokamak hoax. Congratulations. Thanks to New Energy Times reader Tom Carey for alerting us to a technical error in the article "International Collaboration Advances LENR Frontier" in issue #25. We wrote, "As well, the power consumption dropped as a result of the increased resistance inside the cell." The correction should read, "As well, the power consumption dropped as a result of the decreased resistance inside the cell." I recently learned that my good friend Akira Kawasaki of Los Angeles, Calif., passed away in August. Unfortunately, the old soldiers of cold fusion are dying; they have not learned how to fade away. Gone is Chris Tinsley, at 54 a victim of a heart attack. Giuliano Preparata’s genius flame was extinguished by cancer. Gene Mallove was killed by dark forces; we never will know how powerful these forces were. He was a most generous, enthusiastic, helpful, wise and charming man—and strong, because, like old age, cold fusion is not made for sissies. We have discussed everything cold fusion and more for eight years via the Internet. Death used heavy artillery to defeat him: numerous, intense chronic illnesses. Throughout the ordeal, his body became lethargic, but his soul remained bright and his optimism indestructible. Akira believed and, I hope, now knows for sure that eventually cold fusion will win and prosper and give energy to mankind. Perhaps he knows now how this will be done and when, too. Most of us will remember him taking photos and making video recordings at conferences and workshops. Those on the front line, the staff of Infinite Energy magazine, and other underfunded researchers, know how Akira generously helped them—morally and financially—in an unforgettable manner. But only a few know that Akira was a formidable, self-made cold fusion experimenter, and he obtained some very interesting results. I enjoyed his hospitality in the autumn of 2000 and saw his PC-controlled setup in the garage; it was working for months, continuously. Akira conceived and built it alone, based on the results and ideas of Arata and Les Case: gas-phase, high-vacuum alternating with deuterium gas—a mixture of very fine palladium and carbon graphite, as I recall, at high temperatures. And he had an original system to vibrate the catalytic bed. He measured nuclear particles, but he thought he also saw episodes of local thermal runaway: a logical, bright approach. I do not know more. He kept the details of his experiments secret, and he intended to publish them in Infinite Energy magazine. Akira Kawasaki has a place in the Pantheon of cold fusion. Please remember him when the good days arrive. "We’ve established a sustained nuclear fusion reaction." " ... the bulk of the energy release is due to an hitherto unknown nuclear process or processes ... "
"There are some curious reports - not cold fusion, but people may be seeing some unexpected low-energy nuclear reactions." "It isn’t quite cold, and it’s probably not fusion, but something is going on." Allan Widom, a condensed matter physicist with Northeastern University, and Lewis Larsen, president and CEO of Lattice Energy LLC, have taken bold steps to suggest that they have figured out the mysteries of cold fusion. I, through New Energy Times, have taken the bold step to pay attention to the Widom-Larsen theory, despite advice to the contrary. Only one little problem. They say it ain't fusion, folks. Many researchers within the CMNS community have suggested that Allan Widom and Lewis Larsen—and anybody who pays any attention to their ideas—are being foolish and risking embarrassing themselves and even harming the image of the field with such nonsense. Let's rewind just a bit. I began looking into "cold fusion" seriously seven years ago. Just about every single person who knew me thought I was a little kooky to begin with, but that didn't keep them from laughing. My friends and family humored me, and bless their souls, they were all very polite about it. In 2004, I wrote a book with Nadine Winocur, at the time my wife, and we said that cold fusion was real. As expected, Bob Park sneered at us, and I consider his snide comment about me in his "What's New" a place of honor. But some people looked deeper. I am now in India, I have been here for 12 days. For the first time in 17 years, members of the Indian atomic energy community are considering resuming LENR experiments, and they have asked for an update on the field. But let's get back to this kooky nonfusion theory by Widom and Larsen. It won't be the first time I've been willing to embarrass myself, and I'm sure it won't be the last. First, however, I should offer my standard disclaimer. I'm not a physicist, and I don't even play one on TV. I don't even have a science degree. So how can I possibly talk intelligently about nuclear physics theories? Well, mostly I can't. But I know people who can, and this is the core of my investigative journalism process. I am grateful to have learned the basics of nuclear physics, from university professors and nuclear engineers, in the course of my journalism, and I can follow a general conversation about the matter. Don't ask me to calculate anything that requires more than 10 fingers, but I, like most adults, do have a good idea of at least two of the four fundamental forces; electromagnetism and gravity. I'm just beginning to learn more about the strong force and the weak force. I began looking at "cold fusion" in detail after attending the 10th international conference in Cambridge, Mass., in August 2003. I couldn't make heads or tails of the various theories, and being ignorant of nuclear physics didn't help much either. Some folks said that "cold fusion" worked by the joining of the centers of two hydrogen-type atoms. In science-speak, this is the fusing of two deuterium nuclei. A deuterium atom is like hydrogen; it has a single proton, but it also has a neutron. If you strip the single electron from the hydrogen atom, you have the nucleus. And some folks said the answer to the mystery of the heat-producing reaction announced in 1989 by Martin Fleischmann and Stanley Pons at the University of Utah was from the joining of three, four or more deuterium nuclei. Some people said it didn't even require deuterium (a special form of hydrogen). They said that regular hydrogen could explain some of the phenomena, but they didn't suggest that regular hydrogen was creating fusion reactions, because that was really pushing it. Proposing how two deuterium nuclei can come together and fuse is hard enough, so nobody that I know even suggested that two hydrogen nuclei could fuse together. The improbabilities are way too high. The fusing thing happens like this: Picture two magnets with similar poles; they do not like to come together. Funny thing, though—if you have super-human strength and somehow you can push two deuterium nuclei close enough together, you'll overcome their natural repulsion because, when they are in short range of each other, another force takes over. That's called the strong force. I was aware of a dozen proposed fusion theories as well as a few spin-off ideas from each of these. The funny thing was that everyone who had a theory thought that his or hers was right and that the other theories were wrong. Even with my meager math skills, I could see that this didn't add up; in fact, mathematically I suppose one could say they canceled each other out. That led me nowhere, and I paid little attention to theory for quite a while. The first data point on this trail occurred on May 29, 2005. Vincenzo Valenzi, coordinator of the Centro Studi di Biometeorologia of Rome, included me on a distribution that reported a seminar given by Widom that was held at the University of Rome-3 on May 27, 2005, titled "Weak Interaction and Cold Nuclear Reaction." Francesco Celani also sent an e-mail to his colleagues encouraging people to attend the Widom seminar. Valenzi said the seminar had been organized by himself, Gianni Degli Antoni and Flavio Fontana of Milan, Paolo Manzelli of Florence and Fulvio Bongiorno of University of Rome-3. Valenzi said the reaction from Bongiorno, professor of mathematical analysis, was that the "presentation of Widom was very important and rich of possibility to develop something like a new Manhattan Project." But I didn't pay any attention to this matter until June 2005, when David J. Nagel, a professor at the George Washington University encouraged me to look at the Widom-Larsen paper. Nagel, a physicist who worked for 36 years at the Naval Research Laboratory, considered the Widom-Larsen paper worthy of serious attention, and he thought that it might prove to be a viable mechanism for "cold fusion." I told Nagel that it looked Greek to me, and he helped me understand a few of the basic concepts. In November, I got wind of another small conference in Italy on Oct. 14 that featured Widom. I also saw a flurry of lively e-mail exchanges with many Italian scientists and a few Japanese scientists. I read an optimistic quote about the Widom-Larsen theory from Lino Daddi, a physics professor with the Italian Naval Academy. "Perhaps we have a theory that explains all the anomalous phenomena," Daddi wrote. "The transmutation observed from Yasuhiro Iwamura [Mitsubishi Heavy Industries] are explained without the problematic multiple reactions" of Takahashi's theory, Daddi wrote. I also received an e-mail from physics Nobel laureate Brian Josephson, who looked at the first Widom-Larsen paper. I looked back at my notes and found this report by Valenzi, translated by Yogi Srivastava, which I had not read in detail at the time, from the day after the Widom seminar. On Friday, May 27, 2005, a meeting was organized at the University of Rome III to discuss the controversial aspects shrouding low energy nuclear transmutations. The meeting was addressed by Allan Widom, professor of theoretical physics at Northeastern University, Boston, Mass., U.S.A., by Drs. Giuseppe Quartieri and Vincenzo Valenzi from the Center of Biometrology, Rome, and by Dr. Francesco Celani from INFN, Laboratorio Nazionali di Frascati, Italy. Professor Fulvio Bongiorno from the Department of Mathematical Analysis, University of Rome III, acted as the host and moderator of the assembly. Widom presented a lively and personal account of his involvement with various aspects of low energy nuclear reactions containing precise theoretical and experimental details. Quartieri and Celani illustrated their own involvement with specific issues concerning nuclear reactions. Valenzi discussed fundamental philosophical issues associated with the problem of nuclear reactions and the hypothesis of clean energy production, which is completely biodegradable, leaving no dangerous radioactive residue. Such research has been subjected to extreme difficulty because of a remarkable opposition from many sources. Hence, the “engagement” and the depth of the above contributions lead one to recall the period around 1940 when far-reaching studies into the atomic nuclei were carried out. One may even be tempted to bet on the success of the present endeavors. At its base, there was an ample discussion covering two cardinal issues of security and pollution, both essential. An affectionate homage was paid to the memory of Professor Giuliano Preparata, a well-remembered master, whose scientific contributions in this field remain alive and well. At around this same time, I began to hear a few comments from some CMNS researchers that the Widom-Larsen theory was wrong, but they failed to come forward and voice their dissent directly and publicly. Some people also discouraged me from paying attention to the theory. I learned that the Widom-Larsen theory cited some light-water experimental work by George H. Miley et al. at the Department of Nuclear, Plasma and Radiological Engineering of the University of Illinois. So I asked Miley for a comment. "I've taken a brief look at it so far," Miley said, "and from a first look, this theory agrees with the distinctive multipeak reaction product data from my experiments amazingly well. Testing against experimental data is an essential step that any serious theory in this field must face up to, but very few have to date." Widom and Larsen appear rather confident about their theory. They have published one paper so far, in a prominent European physics journal, and they appear to have submitted four others, each dealing with different aspects of their theory. With each paper, they have distributed a brief announcement which introduces each paper. We have published most of these in New Energy Times. Links to our articles with these announcements and other related information can be found at this Web page. Initially, one critic of Widom-Larsen, "cold fusion" theorist Scott Chubb, told me why he didn't give the theory much credit. "They're outsiders,” Chubb said. “They have not come up through the ranks of the CMNS community, and therefore they have the disadvantage of not really understanding what they are talking about." The rumor mill is in utter chaos with regard to this theory. I have heard people speculate that the Widom-Larsen theory is absolutely wrong and that it is being used to raise money disingenuously with a promise that the theory will lead to success. I also have heard that people at the Department of Energy are enthusiastic about the theory. CMNS theorist Akito Takahashi responded, "What is your belief that you always pick up only one extraordinary theory by Widom-Larsen among so many theories? I do not understand how it is fair." Takahashi, Storms and other CMNS researchers have wanted to know why I've given more attention to Widom and Larsen. The answer is simple. I've heard positive comments and seen positive critiques about the Widom-Larsen theory from third parties, not just the self-promotion of other theorists. As far as any other CMNS/LENR theory, nobody but the theorists themselves has gone out of the way to tell me that any other CMNS/LENR theory could be correct. Not one. I began a quest to seek commentary from wherever I could, within the CMNS community, with physicists I met at the American Physical Society meeting, and elsewhere. I had heard from the SPAWAR researchers that a particle physicist colleague of theirs had a look at one of the papers and that, after a critical review, he was unable to find an error in it. Needless to say, this grabbed my attention. Heretofore, I understood that all other CMNS theories either were incomplete or relied on imaginary physics. This Navy review and others of the Widom-Larsen theory are published at this Web page. "The paper looks good to me," the physicist wrote. "It's a clever idea, I think (clever ideas are always obvious in hindsight)." My attention on the Widom-Larsen theory lapsed until September 2007, at which time Widom and Larsen produced their fifth paper as well as an update to their fourth paper. I began to take a more serious look into the Widom-Larsen theory. As well, I looked for signs of other theories that showed signs of hope. I embarked on a series of approaches. In the first, I attempted to learn more about other viable CMNS theories. In the second, I sought critique of the Widom-Larsen theory from the CMNS community. In the third, I engaged in a detailed critical discussion of the Widom-Larsen theory with Scott Chubb, a theoretical physicist with the Naval Research Laboratory. In the fourth, I engaged in a brief discussion of the Widom-Larsen theory with one of the most prominent physicists in the United States, Richard Garwin of IBM. On Sept. 28, 2007, I sent out a query to the CMNS researchers (I have 260 active researchers listed in my database). I asked only one question: "Is there any one of you who will state, on the record, that any CMNS/LENR theory, besides your own, is a) correct and b) complete?" Naturally, I did not expect any of the theorists to give any of the other theorists credit. But I did expect that perhaps others in the community would be willing to vouch for the merits of some of the other theories. George Miley: "I cannot say yes to either. I attempt to do the best I can and check against key experimental data. However, this still comes heavily from my own views/insight and remains incomplete. However, I find it useful/essential to provide insight into directions for new experiments that I want to do. I do not know of a theory that I would feel is complete in the sense of being able to predict all of the wide range of phenomena that have been reported. Correctness is another issue. A theory may be "correct" in the sense of physics covered, but it may not include the key physics needed to explain the true cold fusion." Sergey Tsvetkov: "I don't know any CMNS/LENR theory that is correct and complete, besides my own. But this theory is not complete now." Vasudev Godbole: "This is a very relevant question. It should have been asked, and thanks for doing it. No CMNS/LENR theory is correct or complete. We are looking for 'hot' (or hot-to-handle) results too soon. The more fundamental question is, How does a deuteron or a collective thereof behave in a substrate or in a variety of substrates? What thermodynamic or solid-state or electromagnetic parameters influence this wave and its transport? Why is there a fixation on palladium or the fluid/electrolytic state? Let us study the deuteron wave function and its transport as the first task. Does the deuteron show any real hybrid-wave-bosonic-solitonic-collective mode and thus make itself nonscatterable, like some kind of Cooper-pair ensemble? Can we induce such a behavior? I have suggested an experiment (not a result) since long ago and hope that someone looks into this proposal (The credit for any success belongs to him, any "discredit" for failure to me. I am putting the word "discredit" in inverted commas because it is no shame to be unsuccessful in a new field). Professor Jean Paul Biberian has done an experiment very similar to my suggestion independently." Bill Collis: "The answer is NOBODY! Unless theorists clarify their models sufficiently to make experimental testing feasible by spelling out exactly what novel predictions are made, there will be little progress." Scott Chubb: "Hagelstein's theory is based on real physics and is 'correct,' within this context. It probably describes fast alpha particle, emission, in particular. I do not believe it is correct, yet, for describing d+d->helium-4+23.8 MeV. None of the theories to date is complete, in the sense that none of them describes everything that has been attributed to CMNS. Hagelstein's theory, as well as my theory, can be reduced to explicit calculations of rate expressions. In this sense, both theories are partially complete. In particular, given enough outside funding, both theories can be used to model experiments, based on real, as opposed to hypothesized, physics. In particular, although somewhat appealing, the Widom-Larsen theory is based on specific premises that do not include key effects (in particular, the d+d->helium-4 reaction) that are extremely important." Declined to be identified 1: "In my opinion, there are several assumptions in your question that I would disagree with. Assumption 1: There is sufficient data to determine what's right and what's wrong. The problem with this assumption is that, with the exception of the SPAWAR co-deposition experiment, I do not believe there is sufficient reproducibility to KNOW what's right and what's wrong EXPERIMENTALLY, so figuring out what's right and what's wrong THEORETICALLY is still for the future. Assumption 2: That ANY theorist will ever admit that someone else is right (i.e., they are wrong), before there is absolute evidence to that case. This just isn't the way theorists work. They are, in general, the most egotistical of scientists. They have to be. They put ideas out, and then the experimentalists go out to try to prove that the theory is wrong. What they do requires intelligence, confidence, and the willingness to stand alone. I doubt that ANY of the current theories is complete, but I would not be surprised if more than one is correct. I have begun to think that what we are seeing is a set of events that are triggered in some yet-to-be-determined manner or manners. Once it starts, then depending heavily on a bunch of complicated things (like the microscopic structure of the palladium, the density of the deuterium within the palladium, whether there is tritium or lithium present, the exact nature of other impurities, etc. ), you can get any one or even more than one of a bunch of channels, hence different results. P.S. The SPAWAR co-deposition experiment is simple. The resulting electrode is where the complication sets in. It is fractal-ish in morphology. There are microscopic domains of all sizes orientations and relative orientations, dislocations, vacancies, variable thicknesses and probably deuterium profiles to go with them, field strengths, etc. It looks simple, but to really know what is happening where and why is likely to be extraordinarily hard to unravel." Ben Filmonov: "Thank you for your question. It is both witty and profound. Though a paper does not express emotions, and maybe that is a scream of desperation? You ask, Is there any one of you who will state, on the record, that any CMNS/LENR theory, besides your own, is a) correct and b) complete? I am sure no one answers YES to both a) and b). No consensus exists in our community. It means that CMNS/LENR field still is in a period of collecting facts and is not ready for comprehensive generalizations. Moreover, we (most of us) are still in captivity of wrong ideas taking a semblance as a reality, and it interferes with the community finding the correct way. I mean an idea of deuterium overloading necessity for intense LENR of D-D fusion proceeding in crystalline lattice." "Sorry to be so negative, but the only theorists [besides myself] I am aware of who appear to understand the basics of quantum mechanics and statistical mechanics and thermodynamics are Widom and Hagelstein. Widom's theory is bold and clever, but it has a huge hole in the middle of it, which is his unsupported assertion that coherent electric field amplitudes in the MeV range exist on metal hydride surfaces. I do not know of anyone in the hydrogen-in-metals field who would agree with this. His He3 conclusion is also a bit hard to square with the contrary evidence for He4. The others are an embarrassment to the field. [Theorist x] has the habit of taking technical terms out of context and wrapping them in quantities of hand waving without any mathematical basis at all. Does he really think we are impressed by this? [Theorist y] also does the hand waving and clearly loves numerical results, but he plainly hasn't the vaguest notion of either quantum mechanics or statistical mechanics. In his world, quantum objects behave as billiard balls. I think many people in the field share my negative view, but most are too polite to say anything. Surely the CMNS experimentalists deserve better than this?" Having received no suggestions from the CMNS community to my Sept. 28, query, on Nov. 2, I sent out another query, this time expanding the search for any theory that "is in any way correct." As before, I requested comments from anyone but the authors of their own theories—no self-promotion permitted. I received no replies. Among a few discussions I read regarding my search, theoretician John Fisher wrote a comment that I thought was appropriate and wise. "People never agree in advance on a good or proper hypothesis for the theory of a new field of science," Fisher wrote. "The test of an hypothesis is the extent to which it explains and predicts observed phenomena, not its initial popularity. Only when a theory provides successful explanations and predictions will people come to agree that it was based on a good hypothesis." Consequently, I sent out another query to the CMNS community on Nov. 26, as follows: "Can any of you point to any experiment that shows a match for your theory? If so, can you please provide me with the related papers and identify the specific experiments for me?" We received replies from Akito Takahashi who directed us to one of his papers, John Fisher, Xing Zhong Li, John O'Mara Bockris, K.P. Sinha and Andrew Meulenberg. Julian Brown did not answer the question but provided an interesting answer. 1. What Is Cold Fusion (LENR, CANR, CMNS)? 3. What Chances Does It Have to Be Scaled Up to a Technology? 4. What Must We Do in Order to Attain This? The results of the survey can be viewed at this Web page. In the second approach, I sought critique of the Widom-Larsen theory from the CMNS community. I referred to the second version of their fourth paper, "Theoretical Standard Model Rates of Proton to Neutron Conversions Near Metallic Hydride Surfaces" for many of the questions. All of their papers are listed and available for download at this Web page. On Nov. 1, 2007, I asked 21 specific questions in an attempt to get explicit, objective critique on the paper. Q1. Are there any specific, explicit errors in any of their five papers? Q2. Richard Garwin has told me that Widom and Larsen are withholding information that explains the gamma shielding. Aside from that, do Widom and Larsen appear to be withholding anything else significant, in aspects of theory or experimental results? Q3. I understand that some experimental observations, when taking into account heat measurements and helium evolution, show that reactions with 23.8 MeV are taking place. This provides a strong indicator that a variation of the third branch of D-D thermonuclear fusion [D+D > 4He (0.08 MeV) + gamma ray (23.77 MeV)] is the responsible mechanism. a) Do you agree with the reported 23.8 MeV experimental value? b) If you agree with the reported 23.8 MeV value, is the conclusion of [D+D > 4He + (23.8 MeV) (heat-lattice)] as the mechanism responsible for LENR excess heat sufficiently proved by the experiments, or is this conclusion only one possible interpretation? c) If you agree with the mechanism, do you know anyone who has been able to do the complete math to show how this mechanism works? Q4. Are there any imaginary assumptions contained in any of their five papers? Q5. Do you have any comment on the sentence on page 1, paragraph 1: "It seems unlikely that the direct cold fusion of two deuterons can be a requirement to explain at least many of such observations because in many of these experiments, deuterons were initially absent"? Q6. Do you have any comment on the sentence on page 1, paragraph 1: "Although other workers[10, 11] have previously speculated on a central role for neutrons in such transmutations, they were unable to articulate a physically plausible mechanism that could explain high rates of neutron production under the stated experimental conditions"? (They cite Mizuno and Kozima. The polyneutron theory of Fisher and the work of Li with weak interactions are not cited. Q7. On page 1, paragraph 3, they write, "The purpose of this work is to estimate the total rates ... " Do you have any comment on the power and/or energy rate estimates that they come up with? Q8. The paper mentions charged particles in various places. Do you have any comment about their theory with regard to the experimental results of charged particle emissions, particularly with regard to the work reported by Forsley, Tanzella, Roussetski and Lipson at Catania? Q9. Do you have any comment on the paper's mention of hot spots and rough cathode surfaces on page 9, paragraph 2? They cite Szpak, Mosier-Boss, Gordon, Dea. Q12. On page 11, paragraph 5, the authors claim that reaction rates are enhanced through the use of heavy water. Is there any reason why their theory would not apply to deuterium systems as well as hydrogen systems? Q14. Do you have any comment regarding the text "Net excess energy, actually released and observed at the physical device level ... " from page 11, paragraph 5? Q15. Do you have any comment on the text "Lastly, successful fabrication and operation of long-lasting energy-producing devices with high percentages of nuclear active surface areas will require nanoscale control over surface composition, geometry and local field strengths" from page 11, paragraph 5? Q16. Do you know whether any paper claiming to explain the mechanism for LENR excess heat has ever appeared in a prominent journal? Q17. If this paper is published, would you care to speculate on its impact? Q18. Specifically, might this be of major or minor help to the field, if any? Q19. Specifically, might this be of major or minor harm to the field, if any? Q21. Did I fail to ask any other important questions? MIT professor and cold fusion theorist Peter Hagelstein sent a critique to New Energy Times but he only granted us permission to publish it anonymously. On that basis, we declined to publish his critique. "What is your belief that you always pick up only one extraordinary theory by Widom-Larsen among so many theories? I do not understand how it is fair." "As you know, I commented on this theory in my book and in the paper I submitted to the ACS proceedings. The theory is so out of contact with reality that I'm surprised that it has gotten any attention at all. Apparently, it is an example of people accepting anything that is stated with sufficient conviction, as is the Larsen and Widom style in their papers. Because it violates basic concepts and ignores accepted data, many of the detailed questions you ask are irrelevant. Nevertheless, perhaps the answers you obtain will finally eliminate this distraction. "I really appreciate what you are trying to achieve, and commend the way you are trying to force a large-scale peer review. Widom's theory is certainly one of very few candidate CF-theories worth taking seriously at the moment. Since I don't think I am going to get a response from Widom regarding my queries, here is my opinion of the preprint, for what it's worth. This IS for the record. It won't make me any friends, but here goes. Since I am a solid-state and QED person, I am not qualified to pass judgment on the electro-weak aspects. Regarding the QED and solid-state aspects, I am rather unhappy with the way Widom and Larsen have chosen to represent the effect of the cathodic surface environment on the electrons as an effective mass effect. The paper would be a lot easier to follow if they had simply come out clean with a statement to the effect that they believe an electron can borrow energy-momentum from the electric field at the cathodic surface which is subsequently paid out as an electroweak vector boson and neutron. This mechanism is perfectly possible to represent as a Feynman diagram, which would make the whole business much easier to understand and critically evaluate. The problem, for Widom and Larsen, however, is that when you express the idea in this, more orthodox, form it rather loses its mystique, because there is clearly no way in which an electron could absorb 1 MeV or so via either a single or many photon absorptions. Their attempt to justify this possibility appears ultimately to rest on their claim that, in their Ref. 20, Kemali, Ross et al. found evidence for collective proton oscillations in saturated PdH. This is simply not the case. I have discussed this matter with Ross personally, and he emphatically denies that the neutron scattering data shows any evidence of collective proton oscillations of the type claimed by Widom and Larsen in the first paragraph of section C of their current preprint Theoretical Standard Model Rates of Proton to Neutron Conversions Near Metallic Hydride Surfaces, Sept. 25, 2007. Without the collective proton oscillation mode, the coherent electromagnetic field of huge amplitude needed for their heavy (read: highly energetic) electrons does not pertain. Needless to say, a thermally random E-field will NOT yield anything like the (huge) time-coherent amplitude quoted in Eqn (87). Since this question of a coherent field lies at the heart of Widom and Larsen's thesis, I consider this objection fatal to their whole attempt at explaining the cold fusion anomalies. As an aside, a theory that predicts H3 and neutrons as the main products does not sit at all well with the observations of countless experimenters - from Fleischmann-Pons onward - of lots of He4, very little He3 or H3 and very few neutrons. More specifically, haven't the Frascati people demonstrated a quantitatively correct correlation of exothermy with He4 yield? In fact, it was this result that turned me into a cold-fusion believer, and I suspect the same is true of many other people. For this reason, I consider the a priori skepticism of Dr. Storms more than justified. However, I find the theory deficient in its own terms, for the reasons set out above. Sorry to be so negative. It is extremely hard to make theoretical sense of the LENR/cold fusion puzzle, and Widom and Larsen at least deserve a round of applause for a brave try. It's back to the drawing board folks." A1. (Any errors?) I have not found any, but I am an experimentalist. LENR theoreticians should provide input on this question. A2. (Withholding anything?) I don't think so. A3. (Agreement with the claimed 23.8 MeV match with third branch of thermonuclear fusion?) I think it is not reliable. A5. (Comments on other neutron-related theories.) I believe that all of these authors are on the right track. Future experiments will determine the origin of the thermal neutrons. At present, Widom and Larsen seem to have the best suggestion (proton to neutron conversion). A10. (Question about melting and boiling metal, the formation of craters and SEM-observed morphology.) We reported such evidence, along with localized concentrations of gold and silver in 1993 (ICCF4), so I believe Widom and Larsen are correct. A11. (Question about transmutation) One of the authors (J. Tian) is working in my lab. We reported evidence of transmutation after hydrogen gas loading of Pd at ICCF-13. A12. (Would their theory apply to deuterium systems as well as hydrogen systems?) Qualitatively, their theory should apply to deuterium systems. A13. (Question about electric and magnetic fields) Widom and Larsen refer to micron-scale electric and magnetic fields which occur at asperities on the cathode surface, whereas SPAWAR used external, macroscopic electric fields. I expect that their paper will inspire others to try this approach. A16. (Do you know whether any paper claiming to explain the mechanism for LENR excess heat has ever appeared in a prominent journal?) If prominent means Phys Rev, Science, or Nature, I believe the answer is no. A17. (If this paper is published, would you care to speculate on its impact?) I expect that the impact will be very positive. A18. (Specifically, might this be of major or minor help to the field, if any?) Major. A19. (Specifically, might this be of major or minor harm to the field, if any?) I believe it can't harm the field at all. "We had a physicist friend of ours who had training as a nuclear physicist (he did some time at Fermi lab) look at the first Widom-Larsen paper. He could find nothing wrong with the math. But the ultimate proof of any theory is what it predicts will happen. This is where theory and experiment have to work together. From my conversations with Larsen, he came to the same conclusion as Stan Szpak that the only way to account for transmutation products requires neutrons. In order to have neutron capture, they need to be slow. Conventional wisdom says that all neutrons, when they are born, are fast. The Widom-Larsen theory describes a way to create these low energy neutrons. Also, neutron capture to cause transmutation should give off gammas, which are generally not seen experimentally, or if they are, they are observed in extremely low levels. Another consequence of the Widom-Larsen theory is the gamma shield which essentially absorbs the gammas - hence no gammas are measured. When I described our results to Larsen regarding our CR-39 work, my recollection is that he said the Widom-Larsen theory predicts that, in light water, we should see half the number of tracks observed in heavy water. We saw three orders of magnitude fewer tracks in light water than we saw in heavy water. The Widom-Larsen theory says that you do not need a deuterium-absorbing metal to get nuclear events to occur. So I guess their theory says that everything occurs on the surface. The implication is that our experiment where we replaced PdCl2 with CuCl2 should have resulted in particle tracks if the Widom-Larsen theory is fully valid. We saw no evidence of tracks. The Widom-Larsen theory probably cannot account for the three-pronged stars we see in the CR-39. These three-pronged stars are indicative of shattering of a carbon atom into three alphas. Neutron energy needed for this is on the order of 14 MeV. I'm sure other people can also show how experimental results don't match up with their theory. That doesn't mean that the Widom-Larsen theory is completely wrong. It just means that they need to modify the theory to account for the other experimental results. This is, or should be, a common practice. As an example of theory versus experimental results gone astray, years ago a fellow at SPAWAR was telling me how elegant and symmetrical the Grand Unified Theories were in describing the nucleus and how those theories indicate that LENR cannot occur. I pointed out to him that those same theories predicted the decay of the proton and consequently were not as infallible as he thought they were. Maybe the thing to do is list experimental results and ask folks if their theory can account for those results." The idea of exploding wires (probably should be imploding wires) is ongoing. Worldwide research started in the early ’50s by the thermonuclear fusion community. The research was first centered at Los Alamos National Laboratory to determine the failure mechanism of Tuck's "perhapsatron." The electromagnetic compression forces perpendicular to the current exceed the lattice attractive forces where wire atoms are crushed into a high-density transient plasma. These phenomena are the cornerstone for the ITER project. This research has progressed during the last 55 years to capacitor-controlled high current discharges into frozen fibers of D2 and D2+T forming high density Z-pinch plasmas (HDZP). These pinched plasmas are inertial confinement fusion systems. This research has been carried out and funded by many national and international laboratories. The results of this research from these studies fit the sonofusion jet systems. The theme of my presentation at the APS meeting in Denver was this very subject. If you have any new information on "exploding" wires that could be passed on, it will be appreciated, for electromagnetic forces are fundamental to sonofusion jets. Per Stringham's request we note the recent paper: Vlasov, Alexander N., Ryazan State Radio Engineering University, Russia, "Experimental Researches of Electrical Explosion of the Wire Spiral Turned in the Torus and Dipped in Water." In the third approach, I engaged Scott Chubb in a detailed critical discussion of the Widom-Larsen theory. Chubb is the author of a theory that purports to explain LENR phenomena as a form of nuclear fusion. Chubb has been one of the most vocal critics of the Widom-Larsen theory and has said that they have committed ethics violations. I took Chubb's concerns about ethics seriously, particularly because he had been the editor of the important special publication by Taylor and Francis titled "Accountability in Research Dealing With 'Cold Fusion" in 2000. Chubb has made multiple references to the work of other theorists from whom he has suggested that Widom and Larsen have taken ideas. In Infinite Energy magazine, Chubb wrote, "Professor Yeong Kim mentioned that he had thought of a similar idea in the past but had concluded that the effect probably would not account for most of the phenomena. … Widom and Larsen appear to have made use of ideas that were also suggested by former University of Tennessee Professor Lali Chatterjee." Chubb also wrote in Infinite Energy that Widom and Larsen's "theory is incomplete. ... The theory does not explain how the resulting reaction ... would lead to observed byproducts, at rates commensurate with experiments." I explored these and other issues with Chubb in a series of e-mail exchanges over several weeks. Chubb had provided New Energy Times with a formal critique of the Widom-Larsen theory in March 2007. One paragraph caught my attention. "On the other hand, Widom-Larsen have failed, abysmally, to cite earlier work related to similar 'theories.' For this failure, at best their presentation of their 'theory' can be viewed as being misguided. At worst, what they have done should be viewed as being unethical. I hope that, in the future, they will refer appropriately to earlier work by others in the field." I thought it was interesting that Chubb was so concerned about giving proper credit to prior authors, considering his rejection of their theory. Who fights over a consolation prize? Steven Krivit: So what's the bottom line, Scott? Do you think Widom-Larsen are right or wrong? Scott Chubb: Thanks for asking me about this. The bottom line involves scientific integrity and its role in scientific discourse. High-quality science involves research involving new phenomena - in this context, the possibility that some of what is suggested, during any discourse, might be correct when the research is at the forefront. In the Widom-Larsen case, especially because the theory might have relevance in "normal water" situations involving Ni, Widom-Larsen might be proposing something useful. But Widom-Larsen used ideas that had been proposed previously, and they knew that they had done this. There are myriad possible outcomes, resulting from not citing earlier work, the way that they did, including the possibility that individuals who have been involved would cease to be involved, thereby cutting off scientific dialogue, and the possibility of litigation. In business, these kinds of factors come into play all the time. In science, these factors simply do not, or should not, belong in the relevant dialogue or lack of dialogue because of the delicate way that science is conducted. In particular, science involves a form of idealistic behavior that includes open discussion. At a more basic level, even if the scientific debate seems to be poorly defined and potentially wrong, citations are important. In particular, in a normal situation in science, as opposed to the broken situation that occurs in CMNS, citations are used to justify job promotions. And not citing work by others is harmful because promotions can be denied. SK: I need to know the facts about your comment "Widom-Larsen used ideas that had been proposed previously, and they knew that they had done this." SC: Lali Chatterjee presented the basic mechanism, involving weak interaction physics, at the Spring 1998 meeting of the American Nuclear Society. That is the basis of Widom-Larsen's theory. There are a number of references to her work in this area that you can find by Googling "Chatterjee Cold Fusion." Chatterjee's theoretical work was published in the 1998 Transactions of the American Nuclear Society, which is a reviewed publication. Widom-Larsen have failed to recognize that "their theory" also is related to Kozima's neutron band theory because, quantum mechanically, the presence of periodic order introduces new effects that require the very slow neutrons, associated with the Widom-Larsen model, to couple to a periodically ordered substrate. Any reviewer of the Widom-Larsen theory who would have prepared his or her review using the existing literature would have required that these works be referred to. Tangentially, possibly, Widom-Larsen also should have cited John Fisher's polyneutron ideas. In any case, Widom-Larsen's not referring to any of these references obviously has harmed the scientific process, and the fact that none of these references was cited reflects a breakdown in the review process. Concerning an entirely different set of issues, related only tangentially to Widom-Larsen's theory and other theories, I believe it is appropriate to point out an omission in how "theory" has been characterized by you and by others. And I do believe that your idea of identifying a way to characterize theories is especially useful, important and helpful. In particular, there is an important omission in your characterization of the models involving the need to include models that make use of quantum electrodynamics. In particular, indirectly, Julian Schwinger and Peter Hagelstein have made use of this idea, through coherent phonons. More directly, Giuliano Preparata and Talbot Chubb and I have used this idea. Important points in this context are: 1.The electromagnetic interaction can be time dependent in a manner that can alter dramatically the "Coulomb Barrier;" and 2. Although a static "Coulomb Barrier," in which the time-dependence of the electromagnetic interaction can be ignored, does apply in d+d->tritium+proton and d+d->helium-3+neutron, in d+d->helium-4+gamma, the electromagnetic interaction, is time-dependent, and the "Coulomb Barrier" must be replaced by a QED barrier. In particular, although d+d->helium-4+gamma has not been studied dramatically, the properties of the reverse reaction, gamma+helium-4->d+d, are well-known, and from the associated analysis, it is known that the "Coulomb Barrier" ideas must be generalized in a way that incorporates time-dependent effects. These same time-dependent effects can be altered dramatically in a solid, and for this reason, credible theories do exist, including ours, Preparata's, Schwinger's, Hagelstein's, and, to a degree, Kim's, that are all based on the idea of replacing the conventional "Coulomb Barrier" with a "QED Barrier." Within the context of how you have characterized theory, I would recommend that you include as a separate category the notion of "QED Barrier" based models. In fact, in my paper for the ACS Symposium Proceedings that you and Jan Marwan are editing, I have included a detailed analysis of the associated physics. I also have simplified significantly how I present this material and the material associated with our theory. SK: Did Widom-Larsen use any calculations or specifically use novel ideas of Chatterjee’s, or is the association with Chatterjee just that she generally was referring to weak interactions? Is there a direct relationship between Fisher and Widom-Larsen's theories? SC: Widom-Larsen also should have referred to George Anderman's ICCF1 paper. The difference between what Chatterjee suggested and what Widom-Larsen presented involves the source of the energy and momentum that makes the weak interaction possible. The interaction, which involves inverse beta decay, which is the fundamental starting point of both theories, was suggested by Chatterjee and published in a refereed journal. very early in the debate. George Anderman (see ICCF1, page 295), from the University of Hawaii, presented an argument that is more sophisticated than the inverse beta decay reaction used by either Chatterjee or Widom-Larsen. The fact that Chatterjee's work was peer-reviewed, however, is significant, and Widom-Larsen's not referring to her work should be corrected, through errata or by other means. Doing this will strengthen their paper, not weaken it. Their doing this, in the case of Anderman's work, also would strengthen their paper. The truth will come out eventually. Widom-Larsen's forestalling full disclosure will result only in pain. SK: Any chance you know how I can contact Chatterjee or Anderman? Regarding your sentence "self-serving and unethical," aren't you making the presumption and prejudice that there was intent on Widom-Larsen's part to omit Anderman? There is a difference between an innocent mistake and a malicious one. Are you absolutely certain that Chatterjee's work is directly related and provides any sort of usefulness to the Widom-Larsen theory? SK: Is there a direct relationship between Fisher and Widom-Larsen's theories? SC: No, there really is not a direct relationship between Widom-Larsen's and Fisher's theories. SK: With regard to your sentence about Widom-Larsen regarding "self-serving and unethical," aren't you making the presumption that there was intent on Widom-Larsen's part to omit Anderman? Is this fact or your opinion? Also, are you absolutely certain that Chatterjee's work is directly related and provides any sort of usefulness to the Widom-Larsen theory or is that your opinion? SC: Their references also excluded Kozima's work, which is well-known. They have not publicly stated that they deliberately left out these references. In this sense, what is expressed is my opinion. However, had their work been appropriately refereed, these omissions would have been required. The associated scientific process, in my opinion, was tainted as a consequence of these omissions. Chatterjee's work is directly related to the mechanism that they have proposed. This is not opinion. It is fact. SK: Can you please show me how the Chatterjee reference is directly related? I really need to get the details on this. SC: Widom-Larsen make use of electron capture (p+e->n+neutrino) in order to circumvent the Coulomb barrier. Chatterjee suggested this same reaction, many years ago, also as a way to circumvent the Coulomb barrier. Anderman went a step further: He suggested that electron capture could occur with the proton, in a deuterium atom, leading the following reaction e+d->bound(n+n)+neutrino, bound(n+n) is a "dineutron" (which is a "particle" that is not stable in free space but, he argued, might be stable in a solid). Chatterjee's idea involves precisely the same reaction as Widom-Larsen; in both cases, protons are involved. Anderman's is a more complicated reaction that could take place without free protons. SK: I was re-reading this earlier message from you. I don't understand what this means: "These factors simply do not (or should not) belong in the relevant dialogue." Can you explain further? SC: What I meant was that true science requires open discourse. Litigation, or fear of litigation, inhibits open discourse. SK: I think I got it. Is this what you are saying? 1. Widom-Larsen used ideas that had been proposed previously by others. 2. Myriad outcomes can result, including litigation, presumably by those not cited. 3. Ideally, these matters should be avoided so science can be open, without fear of litigation. SC: That's a good encapsulation. Beyond fear of litigation, there are additional issues, involving the chilling effect, associated with lack of recognizing the contributions of others. In particular, within the scientific world, citations play an important role in promotions, for example. SK: In a previous message, you wrote, "It is possible that Widom-Larsen were not aware of Anderman's article. I do know that Widom-Larsen deliberately did not refer to nonrefereed papers, and they deliberately did not include references to the ICCF literature for this reason." 1. How do you know what Widom-Larsen did or did not deliberately do? 2. If they deliberately omitted a reference to the Anderman paper, in your opinion, do you think it was an ethical breach, considering that it was not a peer-reviewed paper? SC: I asked Larsen about their references. He was wary of including references to ICCF conference proceedings papers. I do not know whether he was aware of the Anderman article. I am fairly certain that I mentioned the Chatterjee article and that it had been refereed. This article should have been referenced. This did not take place. In my opinion, this was unethical, assuming that Widom-Larsen knew about this article, and I am fairly certain that they did. SK: And how about the Anderman article? Do you think it was an ethical breach for Widom-Larsen not to cite Anderman, even though the Anderman paper was not peer-reviewed? SC: I do think so; but it is possible that Widom-Larsen were not aware of this work. SK: Without published peer review, what is there to distinguish good science from junk science? Isn't this the bar that is set and accepted? If so, why should Widom-Larsen cite a non-peer-reviewed work? SC: Peer review, in the end, is not the key issue. Advancing science is what counts. Jack Sandweiss [editor-in-chief of the APS journals] made the following comment in this regard: "If Einstein had submitted his special theory of relativity in a manuscript for Physical Review Letters, I have no doubt that we would have rejected his paper because we undoubtedly would have asked Lorentz to review it, and Lorentz never believed in the special theory of relativity." The point is that, in "conventional science," peer review has meaning. When the system is broken, other measures come to the forefront. The downloads and discourse through the http://www.lenr-canr.org/ Web site provide examples of how nonrefereed publications can become part of the mainstream, even when the peer-review process breaks down. People cite non-peer-reviewed articles all the time. Widom-Larsen have no valid excuse for doing what they did. SK: A while ago, when I asked you about the Widom-Larsen theory, you sent me the following: "The possibility is that some of what is suggested, during any discourse, might be correct when the research is at the forefront. And in the Widom-Larsen case, especially because the theory might have relevance in "normal water" situations, involving Ni, Widom-Larsen might be proposing something useful." I now understand the aspects of scientific integrity that you mentioned. Now how about the theory itself? Have you been able to identify any flaw or error in it? SC: The electric fields that they suggest appear to be nonphysically large. Also, their mechanism for creating helium does not have the correct energy. McKubre has shown that, within experimental error, the energy per reaction should be 23.8 MeV, which occurs from d+d >helium-4. SK: So let's see if I understand what you are saying. You are saying that McKubre has proved experimentally that the energy per reaction, when using deuterium in LENR experiments that produce helium-4, is 23.8 MeV? SC: That's right. You can find this result in the white paper that Peter Hagelstein, Mike McKubre, David Nagel, Talbot Chubb, and Randy Hekman prepared for the [Department of Energy] re-review in 2004. SK: By the way, you have mentioned that Widom-Larsen have neglected to cite properly some foundational work of many others. Is there any part of your own work that you believe should have been cited by Widom-Larsen or regarded as a contribution to their theory? SC: No, their theory in its existing form is not related to my work. SK: I just want to get clear on something. Are you saying that the Widom-Larsen theory won't work and won't be applicable to deuterium because Widom-Larsen's theoretical numbers don't match the numbers McKubre has derived from the production of heat and helium-4, observed experimentally? SC: That's right. The d+d >helium-4 reaction has a unique signature: 23.8 MeV per reaction. When other products are involved, associated with weak interaction physics, a different value for energy per reaction applies. When I pointed out to Widom and Larsen that McKubre had shown this fairly conclusively, they both said they disagreed with this observation and that larger uncertainties than one quoted by McKubre exist. SK: Is it OK for me to use our previous thread on Widom-Larsen on the record? SC: This is fine with me. The reference, where McKubre reported finding the 23.8, is the Department of Energy white paper. As we went to press, this was as far as I got with this discussion with Chubb. 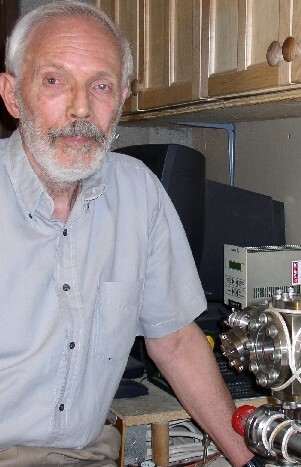 Anderman, 83, still has an office at the University of Hawaii, and he says he is working fast and furiously with a patent application for his cold fusion theory. He had not seen or heard of the Widom-Larsen theory. I faxed him the papers per his request. I asked him whether he thought Widom-Larsen should have cited and credited him in their work. "No, they approach it very differently," Anderman said. "There is no connection between their theory and my theory. I'm working on cold fusion; they're working on something else." I took a close look at the paper Chubb referred me to, "New Physical Effects In Metal Deuterides," which he said showed the evidence for 23.8 MeV energy per helium-4 atom. I was unable to find a reference for an experimental value that showed 23.8 MeV. However, I did find an experimental value of 31 MeV per 4He atom with an error bar of +/- 13 MeV. The way I read the report, the actual value could be anywhere from 18 to 44 MeV. The authors measured excess heat with precision mass-flow calorimetry and performed careful helium measurements. The authors state that there are no other "energetic reaction products." That is, no tritium, helium-3, alphas, protons or neutrons were measured; the only nuclear reaction product is helium-4, according to the authors. So based on the ratio of calorimetrically measured excess heat and the observed quantities of helium-4, the calculation of the reaction energy per helium-4 atom comes in at 31 MeV with a stated experimental error bar of +/- 13 MeV. This gives an experimental uncertainty of 42 percent. I did see the statement in the text: "The Q value of 31 +/-13 and 32 +/-13 MeV per 4He atom measured is also consistent with the reaction D+D >4He + 23.8 MeV (heat)." I find the usage of the term "consistent with" to be wishful thinking at best, and perhaps even disingenuous. They don't mean to suggest that 31 equals 23.8. What they mean, according to McKubre, is that the value 31 is within the range of what they might possibly see if, in fact, the reaction is producing helium- 4 atoms at 23.8 MeV, given the error range and the inability to gather all the helium-4 into the gas phase for analysis. So on close examination, it would be inaccurate to say that they obtained 23.8, or even 24 MeV relative to this experiment. However, they could say the actual experimental value was possibly within that range. McKubre also pointed out to me another experiment from the same paper, (SRI M4) from which they drew several sequential samples of helium-4 and compared them to the value of 23.8 MeV. One sample showed 62 percent, another 69 percent, and another 104 percent of 23.8 MeV per helium-4 atom. This translates to 22.9* MeV with a 10 percent error, giving a range of 20.6 MeV to 25.2 MeV. They achieved this value only in the last sample from this one experiment. McKubre explained that the difference between the last sample and the first two samples is because they "shook the lattice, thermally and by repeated absorption/desorption cycles of D, to remove loosely bound 4He" so they could measure it." Tritium and helium-3 were measured in both experiments and found not to be enhanced above background. The values for these energy calculations are accurate assuming there were no other nuclear reaction products such as neutron emissions or transmutations. I suppose it is possible that the reaction could in fact be producing 23.8 MeV helium-4 atoms, but I'm not quite sure how one gets from that possibility to the assertion that this D+D > 4He +23.8 MeV (heat) is the underlying process, particularly when there is so little support for Hagelstein's model. Perhaps this is one of the reasons that the Department of Energy reviewers had difficulty with the McKubre, Hagelstein, Nagel, Chubb and Hekman paper. I also don't know how they know that the experimental values dictate that D+D > 4He +23.8 MeV (heat) is the only possible nuclear reaction, either. It's appealing, of course, but it still seems like the assertion is unsupported by the data. I sent several of the previous technical paragraphs to the authors for fact-checking. Hekman deferred to the other authors on the technical data but he provided the most surprising comment, considering the fact that he was a co-author on this "New Physical Effects..." paper featuring Hagelstein's "cold fusion" theory, and that Hekman was a key player who facilitated the Department of Energy's second look at "cold fusion" in 2004. "I am personally increasingly impressed with the work of Lew Larsen and Allen Widom," Hekman wrote. "If I were a betting man, I'd say they are likely to make some major advancements in the field in the coming days and months." McKubre responded that they did, in fact, check for neutrons and transmutation and they found none that could account for any significant levels that would change the claimed energy measurements. He also suggested the remote possibility that some sort of exotic products, previously unmeasured in LENR experiments, may have gone undetected. For the record, this is not a third branch of thermonuclear fusion as some people have erroneously stated in the CMNS community, or even a variation of the third branch. If this equation truly represents reality, it is a novel reaction. I also had a conversation with Ed Storms, who said that LENR experiments indicated examples of the second branch of thermonuclear fusion. However, he could direct me to only one experiment, by Aiello et al., that suggested 3.02 MeV protons. In the paper by Aiello et al., it is not clear to me whether they performed a direct measurement of the proton's energies or made an inference or whether the value they obtained and their interpretation are rigorous. I am left with the opinion that there are no rigorous reports of a single experiment of LENR that shows any branch of thermonuclear fusion. The good news is that something nuclear is clearly going on. Something is producing energy in an environmentally benign manner. The bad news is that I feel somewhat uneasy about the theory claims by some LENR researchers, particularly because I had suggested in "The Rebirth of Cold Fusion" that the proposed theory D + D > 4He + heat was "how cold fusion works." Before I get to reporting my exchange with Garwin, in which he, one of the most critical of the "cold fusion" critics, failed to tell me of any error in the Widom-Larsen theory, I would like to make a few observations about the Widom-Larsen controversy and the response from the CMNS community. In a former life, I was a senior technical specialist in the field of data networking. I remember many times, typically over a few beers, sitting with my colleagues and arguing about many inane and hair-splitting details about the merits of frame types, packet sizes and transport protocols: which ones were better, faster, etc. The thing I found most interesting is how clever and vociferous enthusiastic technical people can be when they (we) are arguing a point. As I stated at the beginning of this article, I am not a physicist, and it is impossible for me to make my own technical evaluation of the Widom-Larsen theory. I understand that even being a physicist may be insufficient to fully evaluate the Widom-Larsen theory; one may need a background in either astrophysics or particle physics to follow this theory. 1. The responses are all over the map. Some people say the theory is without error; some say it violates basic concepts. I find this spectrum most interesting. 2. With rare exception, the outspoken people within the CMNS community do not appear to see the potential value in the fact that this theory has correct math, it lacks imaginary assumptions and has at least some matches to experimental data. 3. Many people within the CMNS community seem to be willing to tell me about character issues that they see with Widom and Larsen. I have declined to publish most of these, though Scott Chubb has published his personal comments about Larsen, so this is not new ground. I have provided Larsen with an advance copy of Chubb's critique and afforded him the opportunity to respond in this article. 4. I notice an element of suppression among some of Widom-Larsen's critics. For example, one of them wrote about my pending investigation, "Perhaps the answers you obtain will finally eliminate this distraction." The person who said this explained it to me later. The rationale focused on protecting the public from spending its money on bad science. Chills went through me as I recalled a comment by Steven Koonin (at the time with Caltech) to reporter Tom Gieryn on Nov. 16, 1989, when Koonin was asked about his role in the JASONS. "I would just start to make sure nothing dishonest is foisted on the public," Koonin said. "[The JASONS] are a group of physicists who advise the government. One of the things they do very often is to debunk crazy schemes that somebody wants the government to fund." Gieryn was, as I am now, alarmed. He asked Koonin whether his actions with the JASONS weren't a conspiracy to suppress. That was 19 years ago. Who knows? Considering the failure of Garwin (at one time JASONS’ chairman) to find a flaw in the Widom-Larsen theory, perhaps the JASONS are taking a second look at LENR. After all of the issues Chubb brought to me about Widom and Larsen, he was unable to show me anything that was technically wrong. He said that Widom-Larsen failed to cite Kozima. In fact, they cited Kozima in the second release of their fourth paper. Chubb stated that Widom-Larsen should have cited Fisher. Wrong: Chubb later contradicted himself and said Fisher's theory was unrelated. Chubb said that Widom-Larsen failed to cite Anderman. However, when I spoke to Anderman, he didn't agree. Chubb said that Widom-Larsen failed to cite Chatterjee. I spoke with Lali Chatterjee. She didn't have enough time to read and comment on the papers. However, she has not kept up with the subject and did not recall whether her paper depicted any viable mechanisms; she did not have any problem being forgotten in the history of this subject matter. Chubb used McKubre's helium-4 measurements to say that Widom and Larsen were wrong. At best, Chubb used circular logic and unintentionally may have exposed a long-standing myth in the CMNS field. I am aware of at least two other researchers in the CMNS community who have privately said they thought of the Widom-Larsen ideas first. I do not doubt that other people may have had similar or identical ideas. After all, it is well-known that many innovative ideas surface spontaneously. Unfortunately, history, the Nobel prize committee and the patent office give out only first prizes. Perhaps Widom and Larsen have put the whole thing together coherently and published it first. After all the huffing and puffing, what appears to be left are ego battles and envy. Certainly, Widom and Larsen appear to be withholding intellectual property secrets about their theory, and some people will, understandably, be angry about this. If Widom and Larsen are correct, then it would be in everyone's best interest to make haste and to figure out what they've figured out and get it into competing applications. If Widom and Larsen have a partial or complete answer to "cold fusion," as they claim, and it turns out that it's not fusion, does it really matter? Sure, I published a book proclaiming the reality of cold fusion. So what if I was wrong about what I accepted and believed as the underlying mechanism for Fleischmann and Pons' excess heat? Big deal. The theories were speculative to begin with. What convinced me, and many other people, of the reality of this field was the experimental work. We analyzed the experimental studies, cross-referenced them among various laboratories around the world over many years, found no significant errors of procedure or data analysis and saw unmistakable correlation among the data. If a viable theory explains 19 years of an experimental mystery, this should be cause for celebration, not bitterness. "Cold fusion" has followed a true path of the scientific process. It began with experiment, observation. If Widom and Larsen are partially or fully correct, bravo to them! If other theorists are partially or fully correct, bravo to them, as well. But show me the math, please. There is one more observation I wish to make and the coincidences of this one are curiously ironic. When Fleischmann and Pons sent their manuscript to Nature in March, 1989, it landed in the hands of Garwin's daughter, Laura. She sneered and scoffed. "It didn't have the elementary control experiment," Garwin wrote. "The obvious thing you see when you look at that paper is, Why didn't they do it with H2O? Any high-school student could've refereed it, because of that obvious ingredient of the scientific method." Knowing full well that the science community would flush the discovery down the toilet if Garwin's idea of a control showed positive results, they courageously performed such an experiment. And most remarkably, it showed some positive signs of excess heat. Pons reported this in an April 17, 1989 press conference, it was reported in Nature on April 27, 1989. Certainly Fleischmann and Pons can be criticized for many things. But the courage and integrity required of Pons to report what he observed, in the face of such adversity, should not be forgotten. I will permit Richard Garwin to have the last word in this article. Richard Garwin has had a long and interesting relationship with the "cold fusion" field. He had been one of the first to take a shot publicly at Fleischmann and Pons. "Somebody is going to have to eat his hat," Garwin wrote on April 20, 1989, in Nature. "Within the next few weeks, experiments will surely show whether cold nuclear fusion is taking place; if so, it will teach us much besides humility." Throughout the 19-year history of "cold fusion," Garwin continued quietly to keep tabs on the subject. In the 1990s, after Caltech "disproved" cold fusion, he visited the SRI International cold fusion laboratory in Menlo Park, Calif., to audit its alleged successful "cold fusion" experiment. He later also visited another laboratory, in Paris, France. He was none too pleased when he learned that I obtained, and published on the Web, his report from SRI International. He and Caltech's Nate Lewis held a cold fusion cell in their hands there, and their report to the Pentagon said that the cell had produced excess heat with a 10-1 signal to noise ratio. Some time after that, I challenged Garwin when he wrote a few derogatory and unscientific comments about the French LENR researchers to Washington Post Magazine reporter Sharon Weinberger. He appears to have gone to great lengths to reject the experimental results of the field. Thus, I've learned from him some of the best possible arguments that people have come up with to justify calling it a nonscience. After communicating with him over the telephone and e-mail, I finally had the chance to meet him on Feb. 16, 2007. I was attending the American Association for the Advancement of Science annual meeting. The speaker, John Holdren, let me and the other 2,000 people in the room know that Garwin was there. It wasn't subtle. Holdren flashed larger-than-life portraits of physics luminaries on the projection screens. Most of them were from the past; a few were still with us. And he told us that Garwin, a man whom he had much admiration for, was right there in the room with us, gracing us with his presence. As luck would have it, shortly before the end of Holdren's presentation, I spotted Garwin heading for the exit, and the paparazzi in me took over. I rushed over to him as he was on the way to the escalator and introduced myself. He told me that he didn't have time to stop and talk, but I rode with him down the escalator and walked with him to the door, to his apparent irritation. I asked whether he had seen the Widom-Larsen theory. After a moment, he said he had. This immediately piqued my curiosity, and I asked my normal question, "So, what errors have you found in it?" I had only 60 seconds with Garwin before he left the building. During this brief time, he said something about a problem with gamma shielding which I didn't completely follow. I sent Garwin a follow-up e-mail right away to seek clarification. "When I spoke with you the other night I was not clear about your comment," I asked. "Were you referring to an error in their theory or something that was missing from it?" "Could you please elaborate in writing on the specifics as to exactly where you think that we are in error? If the above attribution is accurate, we are very curious about how you came to such a conclusion. "By the way, have you read all four of our papers?" Garwin replied to Widom and Larsen on Feb. 19, 2007, and copied me. "I didn't say it was wrong. I said that I had not received a reply [from you] to my question/suggestion about using such a material as a shield against high-energy gamma or x-rays. "I had told [Krivit] that I had written you and not received a reply and that, if the theory were correct, there should be this shielding capability. "Did you ever reply to my letter of Oct. 10, 2005?" "I suppose you have calculated the effectiveness of these materials in shielding against external x-rays and gamma rays. "Could you send me those calculations and the results of any experimental measurements?" "You are correct - we have not responded to your prior questions about the LENR gamma shielding application. "We did not answer those particular questions because of underlying intellectual property issues. "Nonetheless, we thank you again for your interest in our work." After providing the above messages to me, Garwin replied to me on Feb. 19, 2007. Institute of Science in Society "How Cold Fusion Works"
Institute of Science in Society "Transmutation, The Alchemist Dream Come True"
Chicago Tribune "Nuclear Reactions May Produce Phones' Power"
We are visiting with Dr. Edmund Storms, who recently published his first book on cold fusion, titled The Science of Low Energy Nuclear Reaction: A Comprehensive Compilation of Evidence and Explanations About Cold Fusion. Storms has crowned his 34 years as a radiochemist at Los Alamos National Laboratory and 18 years in cold fusion science with this solidly convincing review of the field. The work is written in a narrative style and is replete with tables and figures to support the text. Extensive references and bibliography enable the reader to identify the primary sources, many of which are available on the e-library Web site, www.LENR-CANR.org. The book has forwards by two distinguished scientists who have long been active in the cold fusion effort. Both Dr. David Nagel, a professor at George Washington University, in Washington, D.C., and Dr. Michael McKubre at SRI in Menlo Park, Calif., regard this work as a benchmark guidebook that will serve scientists and students interested in cold fusion as a must-have reference for many years. I agree with them and highly recommend the book for people interested in the subject. They will find the book well-written and accessible to nonscientists while challenging to serious academics. I commend Storms for the serious effort made to produce this important book. The book is published by World Scientific Publishing Co.; Infinite Energy hopes to offer the book in its catalog soon. Readers of Infinite Energy will recognize Storms as a contributor over the years and as having served on the magazine's editorial board. This interview was conducted mainly by e-mail, given the geographic separation and time-zone difference. The Q&A begins with background on and insight into Storms the man from his early years (not covered in the book). It then highlights key technical information that he has concluded is critical to the successful replication of cold fusion phenomena. John Allen Rudesill: Your landmark book, The Science of Low Energy Nuclear Reaction, provides some career biographical information that gives insight into your adult years. It is always fascinating to know what, if any, experiences from a person’s formative years helped steer them toward the path that they later followed. Can you recall any particular experiences or events from your youth during the end of the Depression and war years that shaped your ideals and ignited your passion? Edmund Storms: Like many people who made science their career, I was interested in how nature worked from as early as I can remember. All through high school, I had a laboratory in the basement in which I did those things modern children are no longer permitted to do, like making explosives and rockets. I taught myself glass blowing so that I could make a Geiger counter to search for uranium. In fact, in those days I had to even make the vacuum pumps because what little equipment that was available was much too expensive for a kid to buy. Nevertheless, I could buy all the chemicals to make all of the common explosives. Because our house was near the edge of town, the explosions raised no alarm. If I had grown up now, I would be looking forward to a long prison term instead of a productive life in science. Back then, chemistry was the science that held a kid’s attraction because all kinds of neat stuff could be made, sometimes with the added advantage of getting the parents’ attention when smoke filled the house. JAR: Something beyond smoke and bangs happened in your youth. How did the development and use of the atomic bombs affect your outlook in your early years? ES: I found the atom bomb to be a horror and I wanted nothing to do with its refinement, even though I eventually worked at the Los Alamos National Laboratory on nonweapon programs. Some efforts are too dangerous for all mankind to be developed, no matter what temporary justification is used. This and other examples have convinced me that human society is eventually doomed because increasingly lethal weapons will be developed under one pretense or another. Mentally corrupt people will find reasons to use them for what seem to be good reasons at the time. I have no doubt that cold fusion will be used to enhance the power of weapons, but meanwhile it can do some good for mankind. Therefore, we in science can only expect to make life temporarily better for ourselves and one another because we need more energy, yet every energy source has the potential to destroy. JAR: You have made a very clear and powerful statement against weapons of mass destruction - in particular, nuclear devices. What was the main reason you chose a Ph.D. in radiochemistry, given your aversion to nuclear weapons mentioned in the previous answer? ES: I got interested in radiochemistry only because I was interested in studying under Professor Joseph Kennedy at Washington University in St. Louis, Mo. He started the field of radiochemistry and was a great teacher with ideas well beyond the field. The field became even more interesting to me when weapon testing dumped a lot of radioactivity on St. Louis. Ordinary people had no idea what was happening to their environment and bodies. My studies gave me a much better idea of what to fear and what to ignore. JAR: During your early years at Los Alamos National Laboratory in the late 1950s, did you ever imagine that there might be some remarkable, even astounding, possibilities for peaceful fusion energy and, further, that you would become an important participant? ES: Neither I nor anyone I know had any idea such nuclear reactions were possible. Yet many people at Los Alamos tried to make the claims work once they heard about the claims of Fleischmann and Pons. I and a few others succeeded, which gave us a reason to continue our studies. Once I was sure the claim was real, I knew it would have a great effect on my life as well as on society. However, I’m sad that it took so long and that the energy problems had to get so serious before people woke up. In addition, the field has been good to me in the interval by giving me something worthwhile to do after I retired from Los Alamos. Other people who tried to stay in the field have not been as fortunate. JAR: You have described in your book some of the events at Los Alamos in the wake of Fleishmann and Pons. What was it like for you at Los Alamos when the their announcement came out, and how did that change your career path at the lab? ES: After the announcement, Los Alamos changed and became a very exciting place to work for a short time. Once the claims could not be easily replicated, unimaginative managers and politicians took over. At the same time, the Department of Energy was applying mindless rules to all work. As a result, a large fraction of the lab retired when they were given a bonus for leaving. Typically, the people in charge were surprised and had to hire many back as consultants, myself included. Eventually, Carol and I completed a house in Santa Fe containing a cold fusion laboratory, which made even working part time at Los Alamos unattractive. Seeing how poorly the present laboratory has been treated by the government, I’m glad cold fusion came along when it did. JAR: Eighteen years have passed since that announcement, and the world has gone through many changes, with the obvious overuse of resources by the growing human population and our appetite for better living conditions. How has your ongoing involvement in cold fusion and low energy nuclear reactions shaped your priorities and values over the last two decades? ES: Studying and researching cold fusion has become my full-time job. Thanks to skeptics, competition for this job has not been high, making my small efforts significant. So, thanks to the skeptics, I have something to keep me busy. For this, I’m thankful. JAR: Do you feel at this point like a man on a mission regarding getting the low energy nuclear reaction technology out of the neonate care and into the mainstream commercial pipeline? ES: I have no mission except to get out of bed without too much effort and challenge my mind in the lab. Society will find cold fusion when the need is greater than the ignorance. Even then, the idea will be fought by established energy industries. I can only provide the facts, rather like scattering seeds with a hope that some will take root. Unfortunately, land in the U.S. is covered by rocks, allowing only a few seeds to grow. I’m too old to remove the rocks, so I just keep throwing seeds. JAR: I see that you don’t see yourself advocating for the acceptance and development of the technology, at least in the vocal and ardent fashion of a Gene Mallove, whose influence continues through his writings and Infinite Energy magazine. What messages do you want your reader to get. Do you expect the reader to be convinced that cold fusion is real and that considerable data exist to support that conclusion? ES: The book was written mainly to show the reality and to help people investigate the subject. I have no idea whether the effect can be made practical. It is premature to expect a practical application and unwise to promise such a result. Nevertheless, I think the probability that cold fusion can be made practical is so high that serious effort is warranted. Meanwhile, the need for clean energy has become so great that all possibilities need to be explored. JAR: You recently made an analogy that describes the main challenge in doing cold fusion and low energy nuclear reaction experiments. You commented that, if the nuclear active environment was the Empire State Building, most experimenters would miss it because they do not know what city it is in! This means that well-designed and -conducted experiments often saw no evidence of LENR or cold fusion because the parameter space explored was in the wrong city, by analogy. Would you give the reader some highlights from your book that summarize how 18 years of collective work has narrowed the parameter space toward more consistent hits on the “Empire State Building”? ES: This is a materials science problem, not a physics problem. Instead of asking what mechanism makes the effect happen, we need to ask what environment is required. A number of methods have been found to work. A search needs to be made to discover what environment is common to these methods. I believe the environment must contain certain critical elements, but unexpectedly palladium is not one of them. Obviously, the environment with its critical elements is rare, although it is occasionally created by chance. The challenge is to increase the probability to 100 percent. Once the environment has been created, the mechanism works automatically without any additional encouragement. Just like fire, it is not necessary to understand the chemical mechanism to make material burn. An ignorant person only needs to make a spark and nature does the rest. JAR: Much of your book reviews the challenges of both properly measuring heat via calorimetry and detecting nuclear reaction products. Do you think the methods you describe and reference can finally convince the more objective skeptics that measurement issues are beyond reproach? ES: The evidence now is so overwhelming and internally consistent that disagreement about the reality would have vanished long ago in any other field. Only the psychological issues prevent acceptance in this field. Too many people will have to admit they were wrong about an important subject. In addition, some small-minded people find the field to be such a good way to describe poor science that they cannot give up the metaphor cold fusion has become. JAR: You chide the pathological skeptics as being the alter ego of those who conduct pathological science. Another very important part of your book examines some of the more promising mechanisms proposed to explain how cold fusion takes place. You compare the mechanisms on their ability to explain the most observations. Can you summarize why the Mills hydrino or, in this case, deutrino particle is an essential part of the cold fusion mechanism, according to your view? ES: Several essential conditions must exist before LENR can occur and be consistent with the “normal” behavior of nature. A source of energy is required along with a mechanism to cause it to concentrate on a few atoms. Common experience and the Second Law of Thermodynamics stand in the way of such a mechanism. In addition, this mechanism must overcome or neutralize the Coulomb barrier. Adding to the problem, this mechanism must be so efficient that it can permit rates in excess of 1012 reactions/sec, while producing a variety of nuclear reactions involving deuterium or hydrogen with atoms having a high atomic charge. Only the Mills hydrino mechanism has all of the necessary features combined into one theory. In other words, LENR requires the existence of something having the basic features of the hydrino. The hydrino forms by an exothermic reaction, which avoids the problem of spontaneous concentration of energy. Its formation can place an electron near the nucleus where it can shield the positive charge of the hydrogen or deuterium nucleus. And it requires the presence of a rare catalyst, which accounts for the unique feature of the environment that makes the process so hard to replicate. A person needs to believe only that the hydrino is real, and cold fusion starts to make sense. JAR: Mills in his early hydrino work acknowledges the potential for facilitating fusion, yet he made a clear effort to separate himself and his technology from the cold fusion camp, perhaps to avoid the attacks from the hot fusion critics and skeptics. As a result, he has had ample sustained funding to develop his discoveries and ideas, and he has his own cadre of skeptics and critics. Do you think it is time to initiate a dialogue with Mills to appeal for his help in understanding the behavior of hydrinos and deutrinos in the nuclear environment? ES: I think having a dialogue with Mills would be very worthwhile. He realized his theory could be applied to LENR many years ago, but he decided not to get involved with the field. I think he was wise because a two-front war is seldom won by the defender. It would be ironic if his generally rejected theory became the long-sought explanation for the generally rejected idea of LENR. JAR: Given your conviction that hydrinos and deutrinos are important or even necessary in cold fusion, wouldn’t it make sense to test the materials used in these experiments for the anomalous signatures Mills has cataloged? ES: LENR, I believe, involves Mills catalysts, but ones that operate only in a solid. These are not the catalysts Mills predicts will work in a gas. The hydrino materials Mills makes, I believe, will be inert in a solid-based LENR environment. Although the general mechanism Mills proposed has universal application, it must be modified when applied to LENR. JAR: Confirming the presence and participation of hydrinos and/or deutrinos in cold fusion would be a big advance in narrowing the parameter space of study and would accelerate advances in the science of low energy nuclear reactions. Can you offer our readers some thoughts and speculations as to how and when this may take place? ES: Because few people believe Mills, general application of his theory to LENR will take a long time. In addition, experimenters generally find what they are looking for. In other words, if the role of the hydrino is not sought, it will not be found. Therefore, I expect proof that hydrinos play a role will be slow to be found and accepted. For example, J. Dufour has provided some observations consistent with this idea, but his efforts have had little effect on the popular explanations. JAR: I and Infinite Energy would like to thank you for your thoughtful and insightful participation in this interview. Steven Krivit: Can you tell me about your background? Irving Dardik: My background is in vascular surgery. I'm a physician. I've done a lot of research, but simultaneously I was involved in sports. I was a sprinter and was competing worldwide. Then, I became the head of the U.S. Olympic Committee on Sports Medicine, starting in the Montreal Olympic games, and a team physician in the winter and summer Olympic games. I founded the Colorado Springs national Olympic headquarters training center. SK: When were you born? ID: Oct 3, 1936. I'm a Libra. This effect that I call SuperWaves comes from life. it explains what's going on at the atomic level. Brian Josephson was quoting someone: "if cold fusion works, life would have exploited it." in other words, life would have exploited the phenomenon that enables cold fusion to work. SK: What does that mean to you? ID: Understanding how life works to explain what's going on in cold fusion. And it's extraordinarily simple. I have exploited SuperWaves to be able to do what I'm doing at age 68, to be able to know that we can reverse chronic diseases like crazy - chronic fatigue syndrome, for example. I figured out how it works. It's not a philosophy but what actually is, and that's the difference. It isn't just a "let's try this; let's try that." There is something very specific that one does; it all has to do with body rhythms, the cycles. As do particles in physics. They are waves as well as particles. I solved that whole thing of wave-particle duality. But going back to where I was with the Olympic committee, the goal being that we were at "war" with Russia and East Germany at the time. They were using drugs in sports, as our athletes were, and we were asking, How can we enhance the performance of our athletes without the use of drugs? How do we solve this issue? And how do we win this Cold War in the Olympics? A few people as well as myself - Bill Simon, Colonel Miller, a couple of other people - decided to set up this national training center in Colorado Springs. I was one of the founders of that and set up the Olympic sports medicine program from scratch. In the late 1970s, I met with Alison [Godfrey], who had been working at Medtronics, which was creating electronic stimulating technologies dealing with pain control without the use of drugs, and she introduced me to that whole concept. We brought that into the 1980 Olympic games, then by 1984, Los Angeles, then Sarajevo. I got married to Alison a year later in 1985. We've been extraordinarily, happily and powerful married now for around 20 years. Alison, interrupt me if I'm saying something inappropriate. Alison Godfrey: Have I ever not done so? ID: Good point. That's right. So, with that in 1984, very much involved in sports, I resigned from surgery in the early 1980s, because I became disenchanted with medicine as it existed - not in a negative way, but I was doing a lot of research, publishing, and it seemed we weren't getting anywhere. There were more and more diseases; more people were dying. It wasn't like we had magic cures, even though we were claiming that we had magic bullets. The Olympics intrigued me because we were trying to work with health and life and seeing what health is versus always working with disease. Then in 1985, I was confronted with a situation where I had one of these "aha" moments, trying to understand what life is all about. I basically recognized how critical rhythms are in life, why and how they really work and what they are responsible to organize. For example, just look at the heart that beats. We look at the heart from a molecular basis - What are the molecules? What are the cells? What is the adenosine triphosphate, what is the calcium, etcetera, anything that's affecting the heart - and look for disease in terms of structural aspects that just happen to beat. And I realized that it's the other way around. It's the rhythms, the cycles, the pattern of the beat that determines what goes on within the heart, and that is connected to the cycles of the circadian rhythm. Are you familiar with fractals? SK: I have a general idea what they are. ID: Self-similar waves on different scales, broccoli or cauliflower-shaped features. The little bunch is similar to the bigger bunch, nested within the bigger bunch. SK: I've seen fractals that are generated from computers. ID: Yes, that's the idea, also analogous to a snowflake. The word fractal means broken, fractured. There is an enormous amount of research now in science, particularly in physics, on the whole concept of the fractal nature of the universe. So it's basically self-similarity - not exact but at different scales. It means that it’s an invariant; there's no single scale that explains the whole thing. There's nothing that says, in other words, wherever you look, it has a similarity, you can't break it down to a single component. It refers to the entire phenomenon. Not that we hadn't had discussions up the gazoo before that, reading books like Fritjoh Capra's "The Tao of Physics” [and Gary Zukav’s] “The Dancing Wu Li Masters.” And, from that, all their references and collecting tons of articles. This happened only because I was interested in life, not disease. I had had death medicine - plenty of it - and then life medicine - in the Olympics. It was like two extremes. I was examining the connection between life and death. AG: Irv, if you can dump it out in seven minutes, I think that's the way it needs to be. ID: Oh, I can do that. What I realized is that all motion in the body is rhythmic. There isn't any linearity whatsoever; everything is cycles. I wake up and go to sleep in a cycle: exercise and recovery, anxiety and relaxation. If I don't eat, I burn calories. Then I eat, and I'm recovering. It's all the same. All behaviors are rhythmic waves, and the obvious one for all of us is the heartbeat. It's a cycle of exercise and recovery, systoli and diastoli. What could be more simple than that? It's waves. And here's the crucial thing: In the history of science, the electrocardiogram is somewhere about 107 years old. It prints out the heartbeat in a linear format, a linear time-scale, speeding up and slowing down. When I was a sprinter, and when I sprinted, my metabolism went to a peak, and when I stopped, it recovered down. The heartbeat did not move in a linear way. The heartbeat and all the pulsing blood vessels were pulsating as waves inside of a wave of metabolism, where the peak heartbeats, at the peak of exercise, had the highest compression frequency and amplitude injection. Fractions squeezed together, and as I went down to recovery, they spread out the wavelength that it creates and slowed down. They accelerated downward, but then the wavelength increased in the peak of exercise was the greatest density. But the chemicals, the molecules, the hormones, everything, the metabolism in the body: During systoli, contraction of the heartbeat, you can rest. The oscillations and the rhythmic communication, the feedback, feed-forward phenomenon: There would be cycles, waves within waves within waves, fractals. I ended up thinking maybe everything in nature is waves and maybe only waves. I published a paper on this in 1986. The phenomenon of waves waving is nonlinear. There are no dimensions. There's nothing linear in nature except that we impose it on our thinking. The waves are nested within waves, and in the peaks of waves, you have the greatest density. SK: Why is it nonlinear? ID: Because the wave does not move in lines; it's not a frequency moving in linear time. Forget time as being a linear phenomenon. Time is rhythms nested within rhythms. We invented a clock and took time and decided it was linear and created a clock and called it 24 hours, when in nature, in physics, it’s known that there is no absolute linearity. When I saw diagrams of atoms - you know, the electron shells - you look at it and you see these peaks of the electron orbits. What is it? These are waves nested in waves, these electron clouds, and if these are nested in other waves, they will maintain their stability. SK: How does this apply to LENR? ID: Knowing that the deuterium atoms and the protons are really, as Hagelstein says, phonons, or waves, knowing that it's all in motion and densely packed, if I know how to shape bigger waves, I can squeeze the motion in the peaks and create heat! And the field of fusion is not fusion of matter; it's the synchronization of waves, and they've got it backward. If you come from the perspective of matter, you have no choice but to use a model of building blocks, because the building blocks are linear scales. You are separating one from the next, and you don't have the connection from top down. In science and medicine, they're always looking for something else, an "elan vital," something that's responsible for organizing. They say, "It's supernatural. It's philosophical. Don't talk to me about it. I only want to talk about building blocks." I'm saying not only is this real but also it has a tremendously spiritual aspect to it, because it means the universe is a unity of one, of an inherent continuum of one. Motion is responsible for matter, and that motion is order, enabling organization and dispersal space. I'm going to jump to something that blew my mind years ago when I saw it: the squeezing of the waves in the peak. Remember Einstein's law: Acceleration is equivalent to gravity? The waves are accelerating, squeezing together. Gravity is the squeezing and pulling together in the peaks, and that's mass. Energy is nothing more. … It's waves waving. Energy is not just mass. They say e=mc^2, whereas in quantum physics, the equivalent formula is e=hv, which means energy is equivalent to frequency. I'm showing that the frequency of acceleration, waves waving, is the mass of e=mc^2. But this is what reality is. If the waves are waving and we can now determine the squeezing, the thing that they are trying to prevent, boom! You now have your byproducts and heat. That's it. SK: How do you know? ID: The wave came from life to figure out how the waves have to be shaped that goes all the way down. SK: It looks like you have an infinite number of variables. ID: Yeah! But I know the shape of the wave. I don't have to worry about the details. I don't have to worry about which phonon goes where. The big wave, which is self-similar, will make sure that they're squeezed. All I want to do is - whatever is down there - make those waves. They are looking under the microscope trying to figure out what talks to what, but I'm saying shape the big waves like in life. SK: How do you plan to wave the particles? ID: I know that a cheetah needs to survive in the wild, so the cheetah is cycling back and forth. It doesn't do marathons around bursts; it makes waves. SK: I mean literally. How do you do this in your experiments or in your health work? ID: Heart rate monitor. It records the data, we go to our analysis and we get a complete nonlinear analysis of the waveforms. I'll tell you how healthy you are, and from day to day, you can reverse disease. SK: But how do you do that? ID: Go run up and down stairs, and I'll tell you how high to bring your heart rate. Do you know the formula in fitness that, as you age, your maximum heart rate drops? ID: It turns out that, as you get diseases, the maximum heart rate drops, and the range narrows. The older you get, the narrower the range, the more chronic diseases you have. Suppose you can reverse that process? What we do is shape the rhythms of someone's activity - 20 seconds or 40 seconds of activity at a time, depending on what numbers we want to hit, how fast I want you to go and how many cycles we do in a set. We cycle it in the morning differently because your physiology is different at different times of the day. I train the early-morning cycles, the afternoon cycles, each one independently. SK: Oh, I'm starting to get it. It's not an external input. It's the body itself. ID: As you shape your rhythm fractally, I'm creating a circadian rhythm that's powerful. It reflects down to the microbe. I'll give you an example. Winter depression: the day cycle is very short, lots of night, dark and cold. At the equator, they don't get depression. So now you have the 24-hour cycle of depression in the wintertime. Fractally, my brain chemistry is going to be oscillating in depression. The waves are going to be very flat. There's going to be very little amplitude. Take the people down to the equator, or do my program. Boom! I reshape their wave as if I was at the equator. That's it. All the history of medicine has been looking for the independent variables. I'm saying that the body is rhythmic. It's a commonality that goes out into nature, the stars and spiraling galaxies! The beauty of this is this is the answer to fusion. Coming from life, knowing how rhythms work, knowing how everything we're talking about, fluctuations, oscillations, vibrations, waves, phonons. It's all waves. Then they take it apart in pieces and try to find a mathematical formula. I'm saying this is what is. Nature is a phenomenon of waves nested within waves. I can explain every physical ... thermodynamics, evolution, that's why Watson is here. Let me encapsulate it in a couple of sentences. The body's rhythms are not linear. If they're only waves, all they can do is wave. The waves are nested in waves in a pattern of self-similarity, so you have density in peaks and spread-out troughs nested as waves within waves within waves, inherently continuous and fractal, and that's responsible for nature's order. The fractal order is nature's order. That gets carried all the way down until there's no longer a rift between life and nonlife. It's waves going down waves within waves, down to the micro. That has a fractal. Just like exercise peaks my metabolism and my temperature goes up, so does the motion of the wave packets and wavicles inside: densely packed, spiraling, moving. We know how to create the pattern of waves nested within waves, as we're doing with the glow discharge experiments. It influences the microscopic motion into a pattern of compression, and the heat will be in bursts - just what they're finding. SK: How did you get into LENR? ID: In 1989, I had been looking at these waves waving, and I said, "Oh, my God." I got into it because I saw the waves waving as an inherent continuum throughout nature. I'm made of atoms and particles. That's what they're talking about. I understood the process from the perspective of SuperWaves. I heard about Fleischmann and Pons, and in 1991, knowing how this works, from waves waving, I applied for a patent. I got a letter from my patent attorney saying they refused to consider it. It was relative to cold fusion and how it really works and what we need to do to make it happen. I said the hell with it. I went to Western medicine and ran into a major crisis in 1995-1996 because of the article in New York magazine. They called it a miracle cure, and that was at the height of anti-alternative medicine. I was no longer practicing medicine then, but I had a license, if I needed to write a prescription and to keep my malpractice insurance. The New York board came after me because I was preaching some kind of an anti-medical-establishment thing. They took my license away. It was not a big deal for me because I was no longer practicing medicine. Now, of course, I have the freedom to do what I want. Our lawyers went to the medical board a couple of years ago to see if they could get my license back. The board said that, if I would offer contrition, they would give it back. I said, "No way. I'm not apologizing for anything. I'm not interested." Anyhow, the beauty of this is now I have a meeting coming up with the head of the lymphoma division of a major hospital. All this means is that coming from life, there is a commonality, a universality of motion which is waves waving waves. ID: Oh, the fusion? Back several years ago, I always had the fusion in my mind. I wasn't really following it. I was doing all this other stuff in the health medical arena. In March 2001, I happened to be in Florida and I happened to meet with Herman Branover. Branover is a refusnik (in the former Soviet Union, someone, especially a Jew, who was refused permission to emigrate, usually to Israel) physicist from Russia who emigrated to Israel and became a very Orthodox Jew. Some people I knew said, "You ought to meet with this guy Branover. He's a top physicist. He's world-renowned." We met with our partner in the medical health arena, Sidney Kimmel, our angel investor and a wonderful guy. He's the chairman of the board of Jones Apparel, a billionaire, who had funded the work we were doing in the medical arena and is keeping us going with the fusion work. He had a hidden belief in the SuperWave theory even though everybody is telling him, "Why are you doing this? You're wasting your millions." ID: Well, now it's starting to change. What happened was that we met with Sidney, and Ehud said to him, "Look, if this is 1 percent right - I said that yesterday - now I think it's a 50/50 chance he may really be right." Branover immediately got going, and within just a few months, we had a laboratory in Israel with a whole team that Branover and Greenspan put together. Greenspan took a leave of absence from Berkeley. It was worth it for him to take a partial leave just to work on this, going back and forth to Israel. It was that important to him. AG: The lab was up and established in the summer of 2001, and they were operational by December. ID: We now have about 15 physicists, engineers, mathematicians working there in southern Israel. Michael McKubre has been there. Peter Hagelstein has been there. This is the group that we work with on the fusion side. Then they met with Vittorio Violante, saw what we were doing, Vittorio presented at the Department of Energy meeting in 2004. He came up to our place in New Jersey, and now we're collaborating with him. He's been making foils for us ever since. SK: So what is the relationship between the Energetics in Israel and the Energetics in the U.S.? Energetics LLC is a United States company. Our researchers are obviously going to be in Israel; we needed to set up a legal structure, given Israeli law. We had to set up a subsidiary in Israel. It's called Energetics LTD, which is wholly owned by Energetics LLC. SK: When you say "Energetics" do you mean "Energetics Technologies?" AG: Yes, Energetics Technologies is the official name. SK: And who owns the LLC? AG: It's privately owned by Kimmel, Dardik and Godfrey, and there are shares for the employees. SK: And all the work is performed in Israel? ID: The experimental work is performed there. The theoretical work is done in the U.S.
AG: How that happened is that Irv started talking about how he'd really like to present his ideas to a physicist, and the people in our lives somehow all ended up saying that Branover is the man you should speak to. He listened, and that's extraordinary. ID: He's a top physicist in the world, and the kind of physics he does has something to do with turbulence, like hurricanes and waves. That's his background, something called magnetohydrodynamics. AG. It's really extraordinary what happened. Branover not only believed that it could be right but went out and put the team together to make it happen. Branover put 100 percent into it. ID: They went with him for two reasons: because they respected him and some of them were his students. AG: These guys gave up their careers to go work with Branover and work on LENR. None of them were working previously on LENR. ID: They had a reason. You see, with LENR today, there is no understanding "why." Somehow this happened. Here's suddenly a "why" and a "how" that we can use to upscale it. SK: From what I understand, you have reported the most remarkable results. ID: That's why. I know how to make it reproducible. AG: These guys came in, not from fusion. This isn't what they were working on when they joined the laboratory. There was no space. These guys found laboratory space and all the equipment and all the personnel and got up and running and then had such extraordinary results. It's unbelievable what these guys did there. They got the first excess heat within six months. SK: Where did your team learn the other basic aspects of LENR research? ID: They are tremendous engineers. They just went at it hook, line and sinker as a team and did it! AG: Branover hired the first two people: Shaul Lesin and Arik El-Boher. They were all Branover's students from Ben Gurion University. Then he went over to Russia and hired the rest. SK: Alison, you're director of public information for the company? SK: Do you devote all of your time to this? You can call me the personnel director and human resources director, too. AG: Wait a minute. May I put that out a little differently? AG: This happens, you know. We're working together all the time. … It's 24/7. AG: Some of the guys that came into the lab share Branover's background in metallurgy. Branover had been very involved in the mixing of metals. They decided that, if Dardik was right, then they could take his theories into a known area that's quantifiable and totally predictable, because they understand how metals behave - up one side and down the other. They could do a mathematical formula in metals, apply the SuperWaves and have it. If it's true, it should be completely predictable in the experiments. So without us knowing, they went ahead and did that test. And they came back and said, “We've done all these mathematical formulations, and we think that, in application, these are the results you could get: the mixing of metals, impurities, strengths in all kinds of different applications.” Our angel investor said, "All right, try it. Let's see what comes out of the experiments." And they nailed it. It was completely predictable. ID: Based on the waves. AG: We're in the process of bringing in corporations and commercializing on the metals side. It looks like, in terms of the overall steel industry, for instance, that the biggest implication will be reduction of waste, so you don't end up with as much scrap metal. ID: Are you familiar with the term “Occam's razor”? ID: The more you can explain with fewer assumptions. Here it is: a single assumption that you can apply. I mentioned that to Ehud Greenspan last night at dinner. I said, "Ehud, have you ever heard of any principle, any understanding of nature that you can apply in atomic physics and in cancer and in Parkinson's and metallurgy and tornados and the Olympic teams and prevention as well as reversal, all in one go?” There isn't any such an animal. Talk about an Occam! This is what nature is and how it works! SK: Is there anything else you guys want to tell me about this? ID: Our interests are not just in LENR but also in the environment. This will have a huge impact, not just on the energy aspect. SK: Two more questions: Are you involved at all with the Israeli government? SK: Are you looking into military applications for your work? AG: No. The dream is really energy, the application of LENR. ID: And in that context, energy, health, the environment, such that we no longer even think of weapons. That's a dream! If we have something that can make the world a better place and understand what nature is and how nature really works and how we are a continuum and connected to nature, we have a whole different view of what we need to do to survive worldwide. AG: I think it’s naive to think that the military applications won’t come out at some point, but I would rather be very heavily involved and know the people that even want the militaristic uses of it than to do the ostrich thing. I would rather be respected and have a voice and try to have the uses remain peaceful. SK: One observer of the field that I know, who is quite astute - he works for a defense contractor in Texas - told me that he sees us at a point in history where we're just starting to see this develop , that two paths will emerge and that it's up to society as to which one we want to place our resources and attention on. AG: You can't avoid bringing it out. You have to face the realities of both potential applications. ID: One of the beauties of this is that this happens to be something that people can understand. Science today is something that is so complicated, but this is so simple. It has the opportunity to get to many people. They will understand the reason why this is so important. It isn't just high-falutin' experts and technologists that run the show. Therefore, it has meaning, and the public can say, "Hey, we want to make it happen." "Use of CR-39 in Pd/D Co-deposition Experiments,"
by Mosier-Boss, P., Szpak, S., Gordon, F., Forsley, L.
Click on any headline to read the entire article. By the authority vested in me as President by the Constitution and the laws of the United States of America...and finding that the United States participates in the ITER International Fusion Energy Organization under the authority of acts of Congress authorizing such participation and making an appropriation for such participation...I hereby designate the ITER International Fusion Energy Organization as a public international organization entitled to enjoy the privileges, exemptions, and immunities provided by the International Organizations Immunities Act. The countries planning the world's biggest fusion experiment have learned not to count on the United States. So this week's decision by the U.S. Congress to strip out a planned $149 million contribution in 2008 to the International Thermonuclear Experimental Reactor (ITER) won't halt next year's planned start of the project in Cadarache, France. But ITER officials say that they will miss the 9% U.S. share if the latest budget decision means that the United States is pulling out--for the second time--of the $12 billion project. Scientists have revealed an important discovery that raises doubts concerning the viability of plans to fertilize the ocean to solve global warming, a projected $100 billion venture. President Bush warned on Tuesday that Iran remained a threat despite an intelligence assessment that it had halted a covert program to develop nuclear weapons four years ago, as the administration struggled to save a diplomatic process now in disarray. Once again facing criticism over the handling - and meaning - of intelligence reports, Mr. Bush said the new assessment underscored the need to intensify international efforts to prevent Iran from acquiring a nuclear weapon. Experts say the sharp growth, if it continues, means several of the world's most important suppliers may need to start importing oil within a decade to power all the new cars, houses and businesses they are buying and creating with their oil wealth. Q: Do you still support cold fusion? A:...I would be disappointed if 'cold fusion' turns out to be a mere laboratory curiosity. But that seems unlikely: anything so novel would indicate a major breakthrough. Of course, if these anomalous excess energy results can be scaled up, that could terminate the era of fossil fuels, end worries about climate change, and alter the geopolitical structure of our planet out of recognition. Adamant: What's the Matter with Science and the Media? The American Physical Society, representing more than 46,000 physicists in universities, industry and national laboratories, regards the fiscal year 2008 omnibus spending bill as extraordinarily damaging to the nation's science and technology enterprise. The bill fails to fund appropriately the research and education programs authorized in the bipartisan America COMPETES Act, which President Bush signed into law only four months ago. The consequential layoffs of scientists and engineers throughout the nation will discourage American youth from pursuing these fields, just as the country needs their participation to sustain economic growth and national security. Planktos Corp. (OTCBB:PLKTE) today announced that it has been informed by NASDAQ, that despite a pending appeal to the Securities and Exchange Commission, that shares of its common stock will no longer be quoted on the Over-the-Counter Bulletin Board effective at the open of business December 19, 2007, due to its failure to file certain periodic reports in a timely manner. Did Planktos Commit a Fraud Upon the Market? On September 12, 2007 Planktos announced a Private Placement...I waited patiently for the required SEC filing...Planktos never filed the required Form 8K. This failure is itself a violation, but it is also a huge red flag. It screams "Pay attention" because smart securities scammers have long ago learned that it is better to make late or no filing than to file inaccurate or misleading ones. Federal funding of physical sciences and biomedical research will not keep pace with inflation under an omnibus appropriations bill passed by Congress last week... The measure, which at C&EN press time was expected to be signed by President George W. Bush before year's end, gives only a 3.1% boost to nondefense federal R&D funding. The New Energy Times (tm) newsletter, Web site, and documentary projects are made possible by the generous contributions of our sponsors and supporters. Publication, in print or electronically, is not permitted without express written permission.